4401 Achras (manilkara) zapota - Sapodilla Alano, Air-layered ? Sapodilla Alano was selected in Hawaii. 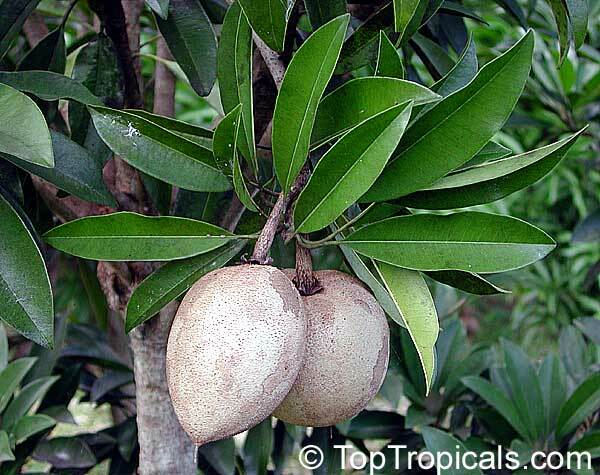 It has a very sweet, top shaped fruit with excellent taste. Has a richer flavor than most other smooth-textured cultivars. The plant is very productive. 4514 Achras (manilkara) zapota - Sapodilla Brown Sugar, Air-layered ? Sapodilla Brown Sugar, superior variety. Originated in Homestead FL. Introduced in 1948. Fruit medium small, 2 to 2-1/2 inches long, nearly round. Skin light, scruffy brown. Flesh pale brown, fragrant, juicy, very sweet and rich, texture slightly granular. Quality is very good. Tree is tall, bushy. A good, regular, high yielder; handles and keeps well. 5967 Achras (manilkara) zapota - Sapodilla Gigantia, Air-layered ? 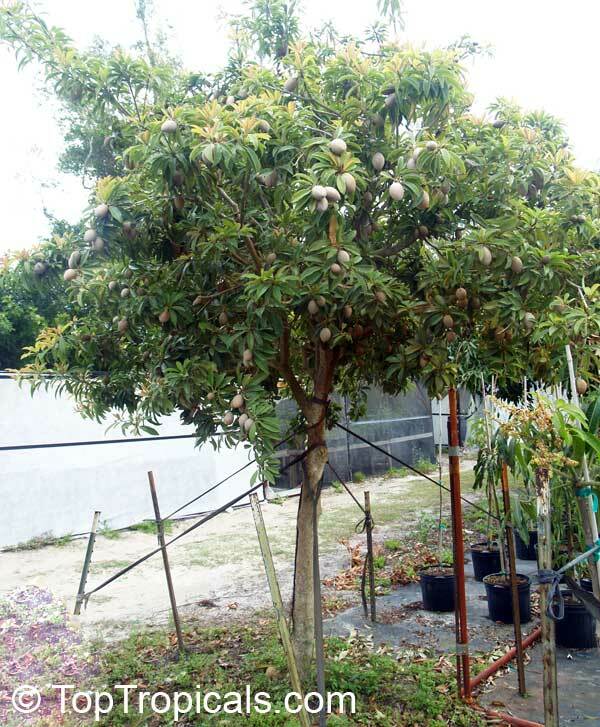 as productive as other Sapodilla varieties. 3025 Achras (manilkara) zapota - Sapodilla Makok, Air-layered ? 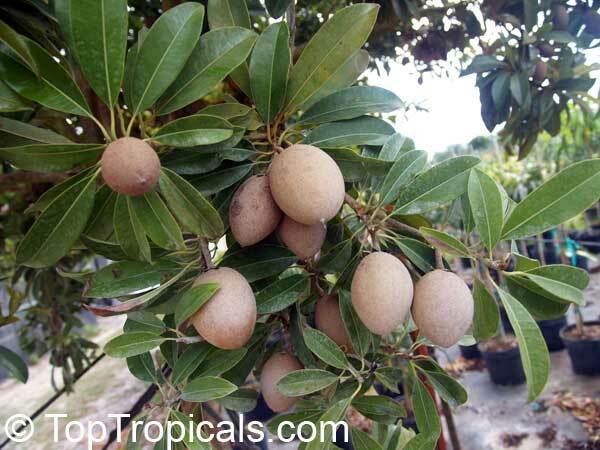 Sapodilla Makok - superior variety, the best producer. Makok is long, pointed, and one of the best tasting in the world. It is native to Thailand, and it is a recent introduction to Florida. This is an excellent variety for homeowners because the tree is a small compact grower perfect for limited spaces. The pulp is smooth and brown with a sweet aroma. It ripens from May to November. 4420 Achras (manilkara) zapota - Sapodilla Molix, Air-layered ? 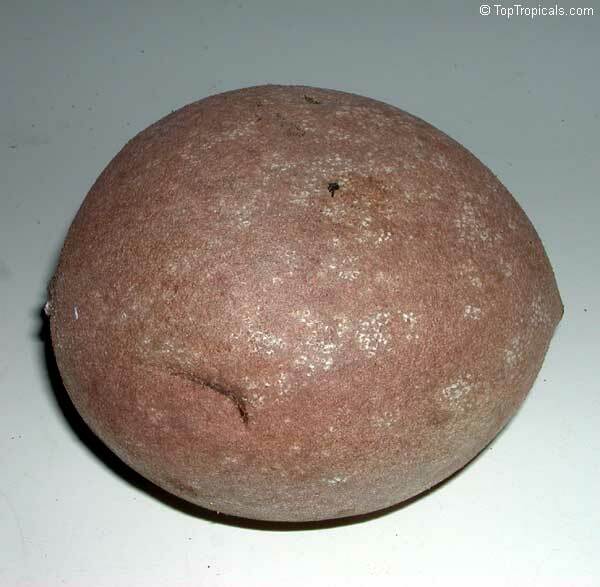 Molix is a football shaped fruit native to Mexico. This fruit is similar to Hasya in many ways, but it tends to be darker brown outside, less red inside, and the tree has curly leaves. The pulp is exceptionally sweet with a fine pear texture and pleasant aroma. The fruit are large typically weighing thirteen ounces. The season differs slightly from that of Hasya, beginning in February and ending in May. 4421 Achras (manilkara) zapota - Sapodilla Morena, Air-layered ? 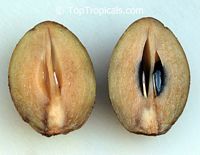 Sapodilla Morena is a football shaped Mexico native. This variety differs from the other Mexican cultivars ever so slightly in taste and appearance, but it tends to out produce all of them. 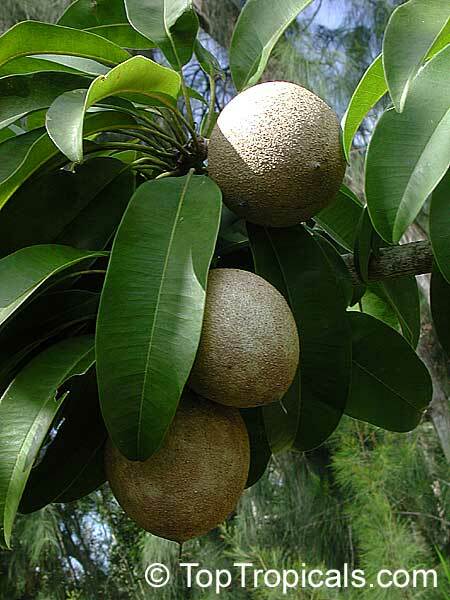 The fruit are not quite as big as Hasya or Molix, but they are still large weighing up to twelve ounces. The fruit ripen from February to April. 3977 Achras (manilkara) zapota - Sapodilla Oxkutzcab, Air-layered ? 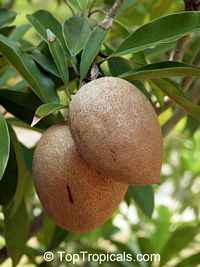 Sapodilla Oxkutzcab (or Ox) - "gigantic sapodilla" - is originally from Oxkutzcab (Yucatan). 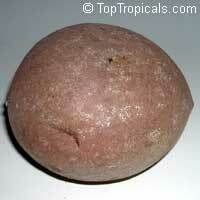 Extremely large (up to 28 oz), roundish fruit with speckled, light-colored skin. Flesh is brown, with excellent taste. Heavily productive tree. Producing heavy crops from May to September. 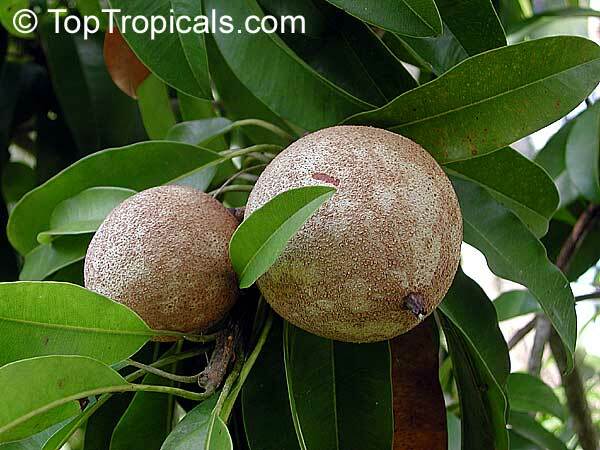 4332 Achras (manilkara) zapota - Sapodilla Prolific, Air-layered ? 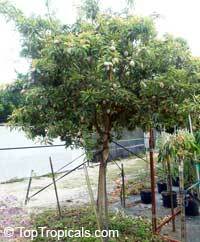 Sapodilla Prolific, heavy producer. The Prolific has smooth pinkish-tan flesh when ripe. 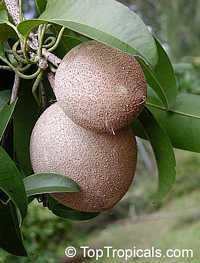 The fruits are round to conical and are long and broad, they tend to loose much of the furry texture on the skin when they are ripe. Trees are heavy bearers. Variety was originated as a seedling grown at the Agricultural Research and Education Center, Homestead, and released in 1941. 3401 Achras (manilkara) zapota - Sapodilla Silas Woods, Air-layered ? 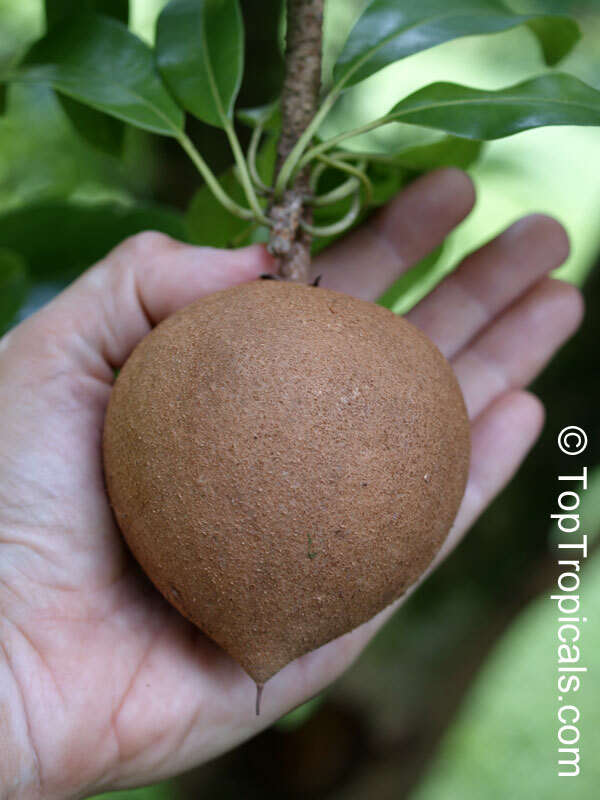 The 'Silas Woods' is an outstanding variety of Sapodilla. The tree has dwarf growth habit (under 20 ft in the ground) and adapts well to a container. This variety is highly productive. Trees are producing year round, the branches often require support as they get very heavy loaded with fruits. Perfect fruit tree for small yards and container culture! The best variety for potting culture - the most profuse producer, flowering and fruiting nearly year round providing bright light and warmth. Although the fruit are smaller than other varieties and average 4-5" size. 3764 Achras (manilkara) zapota - Sapodilla Tikal, Air-layered ? Sapodilla Tikal was selected in the United States. 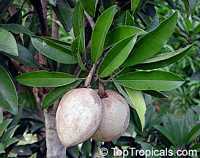 The fruit are ovoid in shape, but are fat at one end. This variety was one of the first superior commercial varieties planted in Florida. Fruit size can vary, but they can get as large as eleven ounces. The fruit ripen from December to March. 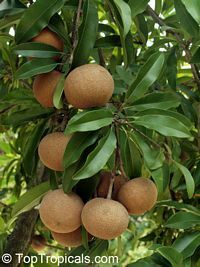 Achras (manilkara) zapota (Sapodilla). For centuries, It has been one of the most popular and most productive tropical fruit trees in the world.Besides delicious fruit, the tree produces white, gummy latex that was an original source of chewing gum (chicle). Sapodilla is a fairly slow-growing, long-lived medium-size tree, upright and elegant, dense and distinctly pyramidal, with thick glossy green leaves. The fruit has gray-brown rough textured skin and pinkish-brown, moist, soft and delicious flesh that tastes like a pear soaked in brown sugar. Sapodilla trees fruit prolifically, at frequent intervals throughout the year. Unlike most of tropical fruit, Sapodilla seeds remain viable for several years if kept dry. They germinate readily but growth is slow and the trees take 5 to 8 years to bear. The Silas Woods is an outstanding variety of Sapodilla. The tree has dwarf growth habit (under 20 ft in the ground) and adapts well to a container. This variety is highly productive. Trees are producing year round, the branches often require support as they get very heavy loaded with fruits. varieties start fruiting right away.